This is a four stall perfect horse barn plan with 12×12 tack room and storage area. This size is very popular and is economical to build. A 12′ wall height is ideal for barns with a 10′ porch on either or both sides. We recommend 10′ height as a bare minimum. Ventilation is important in any horse barn. A slot along the top of the eave walls works better than simply opening windows. Horses are comfortable in winter weather with shelter from direct wind and will live happier and healthier if not placed in a stuffy barn comfortable by people standards. If possible bulk hay and feed should be stored in a separate outbuilding to minimize fire hazard, rodent infestation, and respiratory problems stemming from dust and airborne contaminants from bulk hay and feed. We offer online pricing for 36′ horse barn kits including delivery and detailed DIY building plans that come with all of our pole barn kits. Would it be possible to do this plan in 24×36 by taking off the first set of stalls (just have 1 stall on each side for 2 stalls total)? If so, what would be the cost of such a kit? Hello, it looks like you are just north of Atlanta so a 20 # ground snow load and 90 mph wind zone package will work for you. A 36x24x10 4-12 pitch with 12″ overhang, roof radiant barrier, eave lite panels full length on both 24′ sides, and (2) 12×10 slider doors is $8,798 delivered with plans. Installation cost is $5,000 on a level pad. We suggest you consider building stall kits locally with a local welder building the grills and we can supply the wood based upon the stall configuration you decide upon. We will send a quote to your email. Thanks for stopping by. 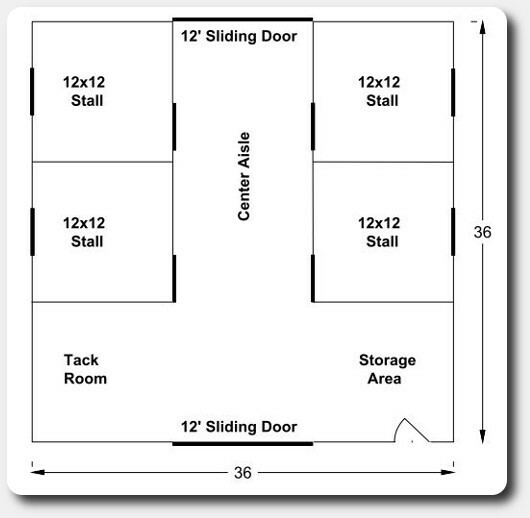 Can you make the stalls 14′ wide instead of 12′? What would the price look like with zip 37095? I would a price on the plans to build this barn I live in RI my zip is 02825. Thank you! We can prepare jobsite specific plans for this design for $350. You get a material list to go with the plans. If you need enginer stamped plans the cost is $1000. We can also provide material for your project from Amish lumber mills (great lumber) and steel with 40 year warranties in either 26 ga or 29 ga.
Let us know if we can help (210) 650 -2276 ask for Kelsey or Robert. I’m interested in this 36×36 barn exactly as it is. Can you please send me information on cost for the plans. And separately a quote for the lumber, materials and all hardware and what’s included (basically wanting to know what I need to cost out in addition to what you provide). Also, do you have references and pictures? I’m in Berryville Virginia 22611. Thank you. We sent a quote to you today. It should be in your inbox. Kristen, We emailed a bid to you this afternoon so it should be in your inbox. Thanks for contacting us.